Although kinases are important regulators of many cellular processes, measuring their activity in live cells remains challenging. 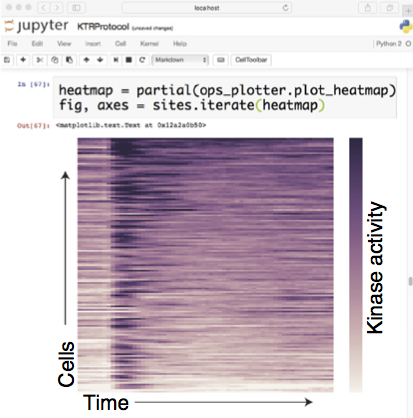 We have developed kinase translocation reporters (KTRs), which enable multiplexed measurements of the dynamics of kinase activity at a single-cell level. These KTRs are composed of an engineered construct in which a kinase substrate is fused to a bipartite nuclear localization signal (bNLS) and nuclear export signal (NES), as well as to a fluorescent protein for microscopy-based detection of its localization. The negative charge introduced by phosphorylation of the substrate is used to directly modulate nuclear import and export, thereby regulating the reporter’s distribution between the cytoplasm and nucleus. The relative cytoplasmic versus nuclear fluorescence of the KTR construct (the C/N ratio) is used as a proxy for the kinase activity in living, single cells. Multiple KTRs can be studied in the same cell by fusing them to different fluorescent proteins. Here, we present a protocol to execute and analyze live-cell microscopy experiments using KTRs. We describe strategies for development of new KTRs and procedures for lentiviral expression of KTRs in a cell line of choice. Cells are then plated in a 96-well plate, from which multichannel fluorescent images are acquired with automated time-lapse microscopy. We provide detailed guidance for a computational analysis and parameterization pipeline. The entire procedure, from virus production to data analysis, can be completed in ~10 d.